Have you ever wondered how long did Lord Buddha stay in Sravasti? Well, for almost 25 long rainy seasons. Confounding, isn’t it. Quite naturally, you would question why? Though, words, as fragile as they are, would simply take away the beauty of this Buddhist pilgrimage destination in Uttar Pradesh. But let’s give it a try. Embracing the archaic unearthed monasteries and sunlight filtering through the Anandabodhi tree, Sravasti Travel simply caresses your soul. Spirituality attains its own meaning in this little ancient city of North India, starkly different from other Buddhist destinations like Sarnath, Bodh Gaya and Kushinagar, lauded for being a part of the Buddhist circuit in India. History of Sravasti reveals how it is related with the preaching of Lord Buddha and has seeped in the history of Jain religion. It is the birthplace of 3rd Jain Tirthankara Sambhavanath. Sravasti travel is unique for its temples, stupas and the monasteries both ancient as well as newly built ones. Also called as Savatthi, Sravasti was founded by King Shravasta during Vedic Period (1750-500 BCE). It was called as ‘Mahid’ during 14th century. Ancient records suggest that it had a population of nearly 90,000 during the 5th century BC. It had two major monasteries - Jetavana where Lord Buddha spent his 16 monsoons and Pubbarama where he witnessed the rest six monsoons. 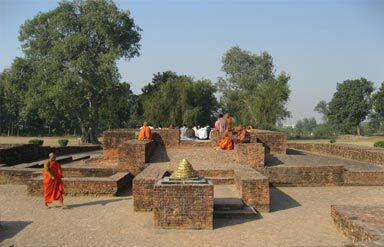 The History of Sravasti states that it served as the capital of Kosala kingdom during 6th century BC- 6th century CE. It was ruled by a devotee of Lord Buddha named Pasenadi. The other famous disciples of Buddha like Anathapindika, Visakha and Suppavasa Koliyadhita also lived in this city. Hiuen Tsang, the famous Chinese traveller found the city in ruins during his travelogues. You will be amazed to see the walls of the ancient city that are still standing erect. Remains of three ancient stupas namely- Anathapindika, Angulimala and an ancient Jain temple have also survived over time. Buddhist monasteries of Sri Lanka, Myanmar, South Korea, Tibet and Thailand are also built at the destination. It is a cluster of shrines covering about 400 acres of land. Presumably it was the actual site of the city in ancient days. Excavations during 20th century revealed the ruins and remnants of the city. Large gateways, numerous stupas and shrines were also recovered in the excavation. They reflect the prosperous past of the district. Saheth is also a cluster of shrines located in the heart of the destination. 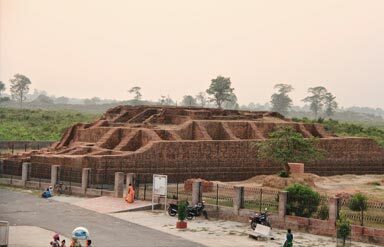 It has several shrines and stupas belonging mostly to Kushan era. Excavations revealed it to be the site of the famous Jetavana monastery. It is presumed to be the birth place of Sambhavnath who was the 3rd Jain Tirthankara. Remains of a famous Jain temple are located at this site. Excavations in the nearby area have revealed ruins of three more temple complexes. Sculptures of Jain tirthankaras in different postures can also be seen in the temple. These sculptures date back to 10th -11th century. It is constructed in a rectangular plan and has undergone several modifications and additions. Kiln baked as well as sun dried Lakhori bricks were used for its construction. This is one of the highly revered Buddhist monasteries in India. It is believed to be a gift from a wealthy merchant named Sudatta to Lord Buddha. It is also said that Lord Buddha was in love with this place and therefore spent 24 monsoon seasons at this site. Remains of Lord Buddha’s hut can be seen amidst the ruins of the monastery. It was one of the largest and most famous Buddhist monasteries in India during the days of Lord Buddha. Outside the monastery stands the Anandabodhi tree which was a brought as a sapling from the Mahabodhi tree in Bodh Gaya. Excavated in 1863, unfortunately it’s the archaic ruins of this stupa that reveal what a majestic edifice it once must have been. An interesting legend, associated with the establishment of Angulimala’s Stupa in Sravasti is even included in several Indian textbooks. Initially, Angulimala was a ferocious dacoit who used to kill humans, in a fit of rage, chop off their thumbs and weave them in an elaborate garland around his neck. Fortunately, after meeting Lord Buddha, he transformed into an obedient disciple. Balrampur(17km), Bahraich(47km), Gonda(48km), Itwa(85km) and Lumbini(169km) are the ideal getaways to visit, as mentioned in the Sravasti Travel Guide. Every tourist spot in the district has a stall near it selling various handicraft items and Buddhist devotional objects. Shoppers can head to Lucknow for a complete shopping experience. Avoid summers as they can be really hot and humid. The best time to visit is during October- March. 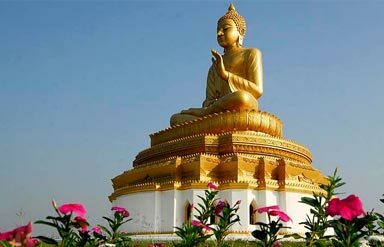 Buddha Purnima (April- May) is also a sought after time to travel. During the festival every Buddhist temple in the district is decorated and the folks are in full festive mood. Air: The nearest airport is in Lucknow, about 151km away from the district. Rail: Gonda Railway Station (17km) is the closest railhead that facilitates trains for cities like New Delhi, Mumbai, Agra, Kolkata and Chennai. Road: Broad and well-maintained roads connect the destination to almost all the major cities of Uttar Pradesh. Trip to North India is meaningless without visiting this destination. 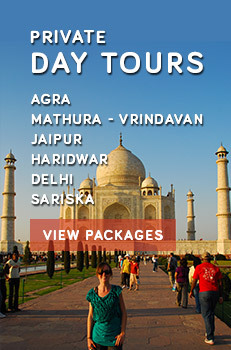 So, book for Sravasti Tour Package and delve into an exploration of a unique site.